Can you send me that list of unpaid invoices? We built Stripe Sigma to help businesses quickly analyze their Stripe data and to enable teams to get faster business insights. With structured access to your data, you can identify which customers are least likely to churn this year, look up which geographies contribute the most revenue, see which products are most popular in February, and much more. Just write SQL queries to create custom reports and get instant answers, right inside the Dashboard—no need to dedicate engineers to build or maintain data pipelines or warehouses. Free data from silos and let teammates from finance, support, product management, and other teams run reports directly and take action faster. Ready to use Stripe Sigma? Activate a free trial for your business or learn more below. We’ve already written the queries for the most useful reports for different types of businesses: From computing MRR to ARPU to analyzing the payment methods your customers prefer, you can jump in quickly by editing one of our pre-built templates or start from scratch to fully customize your report. We’ve also added syntax highlighting, descriptive errors, and auto-completion for data tables and columns—it’s like a built-in IDE for writing queries. The amount (in the smallest currency unit; e.g. cents in USD and yen in JPY). Three-letter ISO currency code, in lowercase. Must be a supported currency. ID of the related payment source. 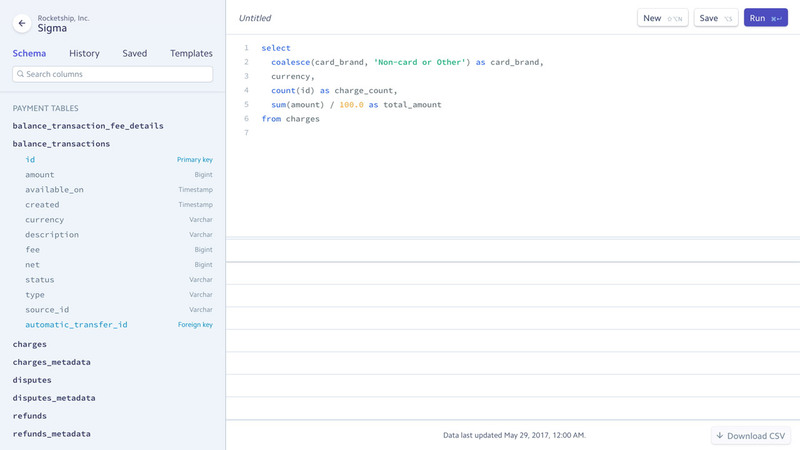 Quick sidebar access to a full map of the structure of your data stored in Stripe (including any additional metadata you send us) makes it easy to combine all the relevant data needed from across Stripe’s products—payments, payouts, customers, subscriptions, refunds, and more. Preview the full schema available in Stripe Sigma. No column or table names matched. Save frequently-used queries to run them again at any time or share a link to a useful query so that any of your teammates can use it too. Can you remind me how we calculate monthly recurring revenue? What was our charge volume last month? How many customers do we have in France? Stripe Sigma has helped accelerate our financial close process. Instead of manually combining multiple data sources each month, we’re now able to run a few simple queries in Sigma, enabling faster monthly reconciliation for credit card transactions. With a query that took less than 5 minutes to write, our team has been able to identify unpaid invoices and recapture tens of thousands of dollars of revenue—8 percent of failed payments—in just two months. We handle orders for thousands of stores, so financial reporting can get challenging. Stripe Sigma gives us a lightning-fast, reliable way to analyze our financial data and helps us run the business more efficiently. Before Stripe Sigma, we built our own tool to analyze our Stripe data, but it took our engineers weeks to build, required ongoing work to maintain and update, and it wasn’t always accurate. Sigma now gives all our teams accurate data without any engineering work. Ready to use Stripe Sigma? Get started with a free trial for your business.